The unthinkable happened during an art auction in London on Friday. Just moments after a painting sold for more than $1.4 million, it self-destructed — literally. 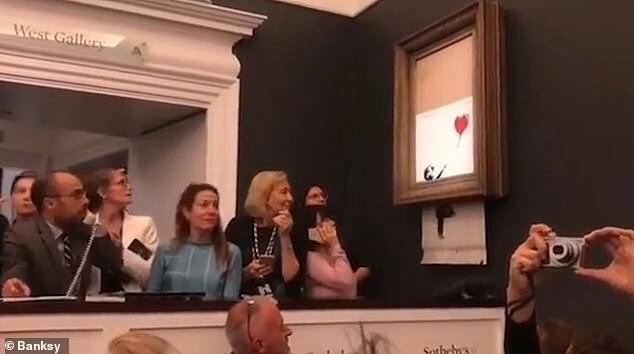 As the final gavel fell at Sotheby’s auction house in London, an iconic painting known as “Girl with Balloon” partially passed through a shredder hidden inside the painting’s frame. The painting was the work of renowned anonymous street-artist Banksy. The artist confirmed the stunt through his official Instagram account, writing: “Going, going, gone…” The artist later posted a video showing him prepare the frame several years ago. “The urge to destroy is also a creative urge,” Bansky wrote, quoting the great artist Pablo Picasso. However, as CNN noted, it’s not clear how a mechanism inside the frame triggered the painting’s self-destruction at the moment it was sold. The painting’s auction tied the record for most money earned for a piece of Banksy’s work. A piece of his art previously sold for $1.4 million in 2008.